At the time of an arrest for DUII in Bend, Oregon, the officer should provide a notice of intent to suspend driving privileges. If the officer fails to provide you with the Notice, speak with a Bend DUII attorney immediately about your rights and the implications of failure to receive a Notice. A DMV Hearing or DUII Implied Consent Hearing takes place following an arrest for DUII in Oregon — but only if requested. However, important and very short deadlines apply to DMV Hearings in Oregon. The deadline to request a hearing following an arrest for an Oregon DUII is short – 10 days. A DUII DMV Hearing can be requested by the individual charged with DUII, or by a DUII attorney. An online request for a DMV Hearing can also be made. As part of the Hearing request, you must indicate what legal issues you anticipate raising at the hearing. Most people charged with DUI and facing a license suspension are not familiar enough with the current case law and do not know the specific legal issues to raise at a DMV Hearing. Nine times out of 10, it is best to have an attorney knowledgeable in DUII represent you at the Implied Consent Hearing. The attorneys here at Donahue Law Firm understand Implied Consent Law. DMV Hearings for Deschutes County are held in Bend, Oregon. Attorney Bryan Donahue routinely requests DMV Hearings for clients and conducts DMV Hearings, in person, on clients’ behalves. To speak with a Bend DUII Attorney about your DUI case and DMV Hearing call us at 541-24-6657 or send us an email. Part of the purpose in requesting a DMV Hearing is to contest a license suspension and avoid insurance increases. If a DMV Hearing is not requested, your license will be suspended for at least a 90-day period. In some cases, such as a refusal, a one-year suspension may be imposed. 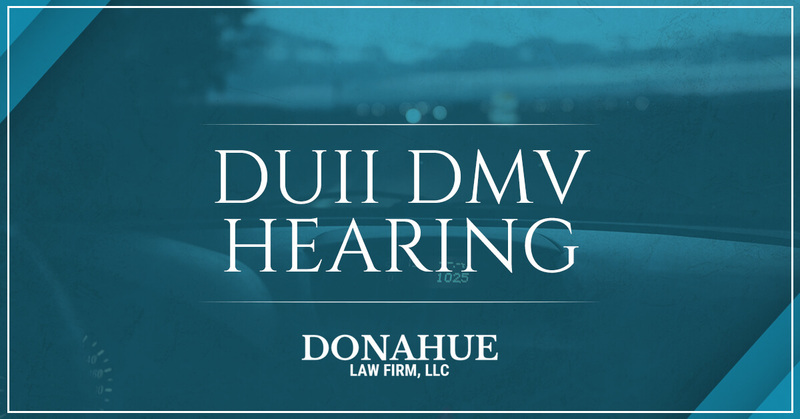 In addition to avoiding an administrative suspension, there are also strategic reasons for why the Donahue Law Firm always requests a DMV Hearing to protect our clients. The importance of requesting a DMV Hearing is not limited to the administrative suspension itself. It is an important opportunity to hear the law enforcement officer’s account of what occurred and shed additional light on what took place. The police report is never the whole story. Testimony and evidence obtained at the hearing can have important impacts on successfully defending against DUI criminal charges themselves. Even if you are from out of state and hold a driver license from that state, but are arrested for DUI in Oregon, you are not immune from a suspension of your driving privileges. This is because all but five states (Massachusetts, Michigan, Wisconsin, Georgia, and Tennessee) and the District of Columbia are members of the interstate Driver License Compact. When a license is suspended in one of these member states, that suspension will be recognized by each of the other member states. Consequently, driving privileges will be suspended in those states, as well. If caught driving in one of these states with a suspended license, a new charge will result: Driving While Suspended, or DWS. Contrary to popular belief, DWS, like DUII, is a crime. Many people forget to request a DMV Hearing within the 10-day period allowed under Oregon law. Even worse, many DUII attorneys do not conduct DUII Hearings. These people then face automatic suspensions and miss out on an important part of their DUII defense. Be sure to hire a lawyer who believes in the importance of requesting and performing a DMV Hearing. If you or someone you know has been charged with a DUI in Bend or a DUII in Central Oregon, and need to speak to a DUII attorney, contact the Donahue Law Firm. The initial consultation is always free. Protect your rights. Protect your license.